General Motors is revamping its lineup to remain competitive, and the 2014 Chevrolet Impala is shedding its commercial fleet clothes and gets a smart, fresh styling as it officially makes its debut today at the New York Auto Show. The first-generation Impala dates back to 1958 when it was first introduced by Chevrolet. Getting its name from the southern African antelope, Chevrolet's most expensive model through 1965 became the best-selling automobile in the United States, competing against the Ford Galaxie 500 and the Plymouth Fury when full-size models were the ticket. While the Impala is an American icon, the car needed a complete overhaul as the full-size sedan had become nothing more than a vehicle used for taxi-fleets. Even though Chevrolet sold more than 171,000 Impala’s in 2011 to become the best-selling full-size sedan in the U.S., most of those sales went to commercial fleets. The 2014 Chevrolet Impala, to be introduced today at the 2012 New York International Auto Show today, takes an aggressive stance, and gets sharper lines and styling cues that Chevrolet hopes will make it appealing to the buying public. "The current Impala is much more of a fleet vehicle than it is a retail vehicle. This will change that," said Chris Perry, GM's vice president of U.S. marketing. "This really does represent a new design aesthetic and a new interior look and feel." 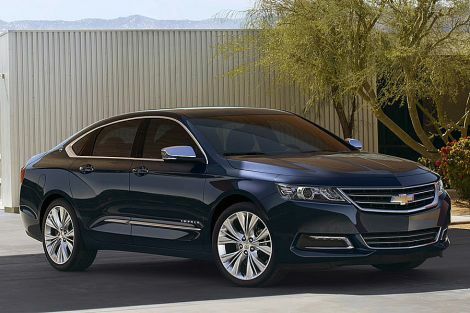 Outside, the new Impala features LED lights that now come standard on most new cars. The body gets all-new sculpted sides, and the old wedge-shape design gets left on the design floor in a heap of clay. An all-new Camaro-styled fascia is a big improvement up front and stylish new wheel options come in 18, 19 and 20-inch sizes. The Chevrolet design team didn’t stop on the outside. Inside, the 2014 Impala gets a redesigned interior with an available 8-inch touch screen display in the center stack. And new soft-touch materials will increase interior comfort. According to GM., better sound damping should decrease road noise to make driving an Impala a pleasant experience. Underneath the new exterior, three new engine options will be available, all with the latest direct injection technology to boost fuel-efficiency. Among them, a 3.6-liter V-6, 2.5-liter inline four cylinder and 2.4-liter four cylinder with eAssist. Finally, the Impala will get the latest in safety technology with features like Lane departure warning, collision alert, braking assistance, adaptive cruise control and more available options with 10 standard airbags and OnStar being standard. The 2014 Impala will be offered in LS, LT and LTZ models, with assembly at GM's Detroit-Hamtramck, Mich., and Oshawa, Ontario plants. Pricing has not been officially announced yet. Stay tuned to Torque News for more details on the 2014 Chevrolet Impala. who cares what u think? Probably the same people who care what you think. Nobody.